BAE Systems Naval Ships wanted each part of the business to see their role as part of one larger offering. Teams often followed their own processes, with little knowledge of what happened before or after. This was both a cultural and a cost problem, with inconsistency causing delays and duplication. Working with senior stakeholders, we defined basic aims and objectives. A common digital portal was then built, enabling everyone to better understand their role and its relevance to other teams. 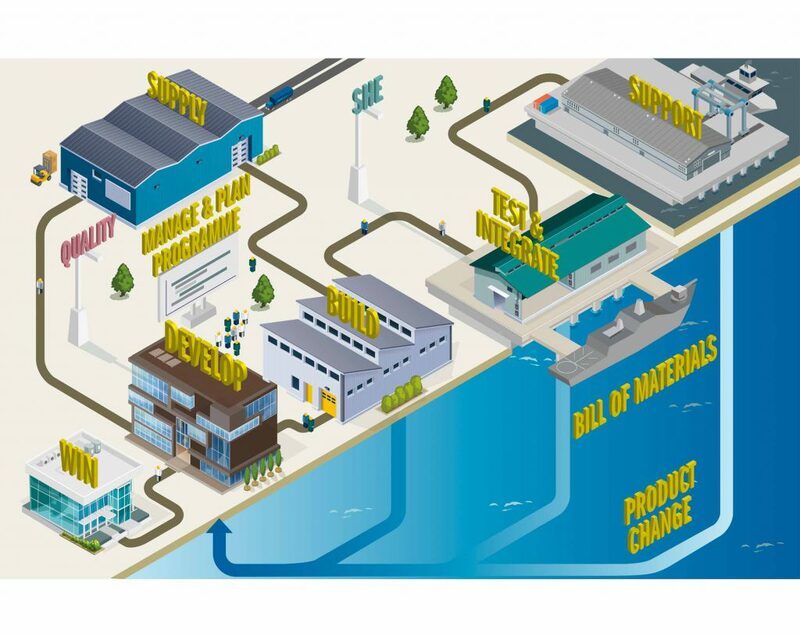 To replace the existing intranet landing page, our interactive rich illustration of a shipyard reinforced the theme of interlinked functions. This single portal enabled staff to both understand the entire project lifecycle and deep-dive into each part to find essential information. The result? Much higher intranet engagement, with users able to logically navigate for the first time. It also exposed process inconsistencies – and became the catalyst for significant systematic change.